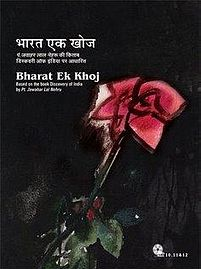 Episode #13 of Hindi TV Serial Bharat Ek Khoj (which was aired on DoorDarshan and now is available as a set of DVD for home viewing); explores the second segment of the tale of Ashoka. The first part of the same is reviewed here. We see that now Ashoka (aka Ashok) is the king of Magadha. He have started spreading his wings to bring almost entire BharatVarsh under his rule and he was on the way to become the emperor. He was very thoughtful and tough ruler. The opening scene of the episode starts in the court of Ashoka. The presence of a sage in black cloths shows us the importance of religious characters in the political system those days. The traditional saints were not much happy with the rise of the faith of the people in Bauddh principles (the way of life and other attributes shown by Gautam Buddha). Through this scene director conveys the reference of the Bauddh monument in Sanchi as well. The scene is also important for exploring immature behavior of Tissa (a brother of Ashoka) which played a key role in Tissa’s life. We also see the importance of confidantes and political characters in the ruling system. A ruler always need them to handle the kingdom and have to control them as well. Ashoka was fortunate and skillful both in such aspects. The scene where Radhagupta makes Tissa to sit on the throne and refuse such provocation in presence of Ashoka who witness Tissa sitting on the throne, is also important scene. Apart from good acting and authentic dialogs, this scene shows how political games were played and being played. A nice quote I recently read somewhere that, the one who doesn’t do back-stabbing despite of getting a chance, is a true friend, in politics. Ashoka this way declares Tissa a traitor and orders a “death-penalty” for him. Om Puri, K. K. Raina and the actor playing Tissa, are all natural in the scenes we have discussed so far. The dialogs are little theatrical, but effective. The sets are thoughtful. We see the art director and director have taken care of smaller details too. The dances we see in various places throughout the episode are well researched and explores the folk dance moves of those times. The director and choreographer didn’t try to make them larger than the life anyway. We see the reflection of day-to-day activity a common man need to perform those days, in these dances. The dialogs at the end of the grace period given to Tissa, are really superb. They are small yet effective, the small conversation of 3 minutes gives us the idea what Ashoka and Radhagupta did and why. And it proves why Ashoka is considered as one of the great rulers. The reason behind and the background setup for the war of “Kalinga” is explored in the scenes after. Watch out the make up of Ashoka when he returns from the war, and you will see how realistic it is. The conversation between Tissa (who is a monk now) and Ashoka after the battle of Kalinga is worth hearing. It then follows by such few more conversations. Again, this episode proves that with good content, good dialogs, great performances; a nice stuff can be made even in the tight budget and technological limitations. You should not miss this episode for the content it possess.